Preheat oven to 180°C (350°F). Place the yoghurt, mustard, salt, chives, celeriac and half the dill in a large bowl. Toss to coat. Place the paprika, sumac, cayenne pepper, garlic, oregano and pepper on a tray and mix to combine. Press all sides of the salmon into the mixture to coat. Place the salmon on a large oven tray lined with non-stick baking paper. Drizzle with the oil and cook for 10 minutes or until the salmon is cooked to your liking. 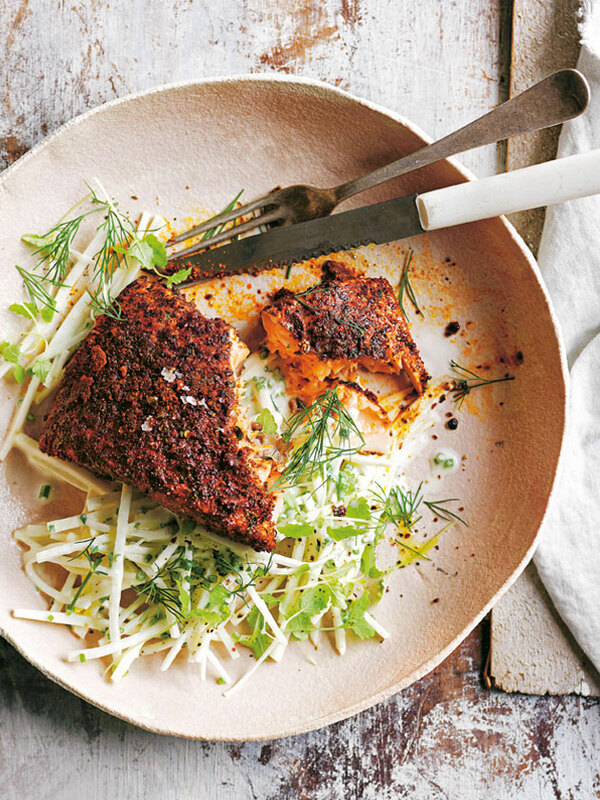 Divide the celeriac mixture and salmon between plates and top with lemon balm, salt, pepper and remaining dill to serve. Serves 4. This is my new go to. Grabbing literally a handful of things from the store, I can have a healthy and very delicious dinner on the table in 15 minutes!